You can buy these connectors worldwide through Würth shops and eshops (locally in each country) but also in ebay.com or electronic dealers like Mouser. Mounting them is really easy, they are sealed against liquid and dust and there can be no mistakes connecting them as there is just one way to plug it. 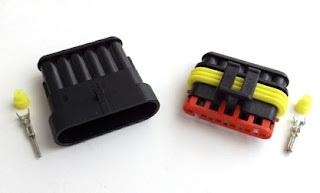 You can also connect and disconnect them as many times as needed and are reliable as DB9 connectors. So for our modules you just have to plug two connectors and all the job is done. There aren't more significant changes. Now we are working on the software debugging and finishing the Arduino sketches for the PC Interface (for both UNO and NANO) and adding the Loconet support to the DCC++ command station software. Everything is already working in our first test modules and it will be published soon. As in previous version we decided to use the Loconet Over TCP protocol implemented with an Arduino NANO. This keeps the system independent from the command station. Using the PC interface of the command stations normally means you cannot change it because the command station PC protocols are neither generic nor standard. This will allow to anybody to use any other command station Loconet compatible (Uhlenbrock, Digitrax, Digikeijs, ...) with our modular system.